Here we go! Triple-digit temps have arrived in AZ and they’re here to stay until probably October! Ever started looking for something and gotten so sidetracked with other discoveries that you forgot what you were looking for in the first place? The other day I was looking for the spare key for one of my cars when I dug up a few oldies from the photo album archives. I figured I might as well share them here. Here’s a picture from probably 10 or so years ago. 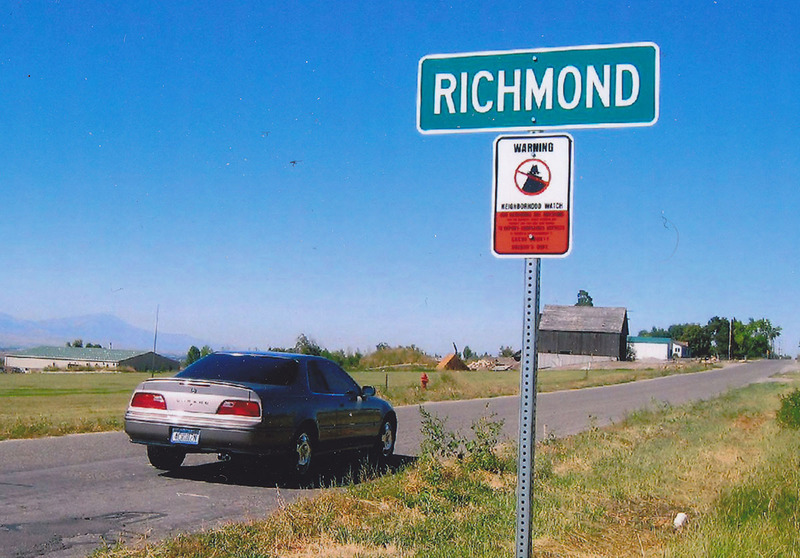 When I was born, my family lived in Richmond, Utah. 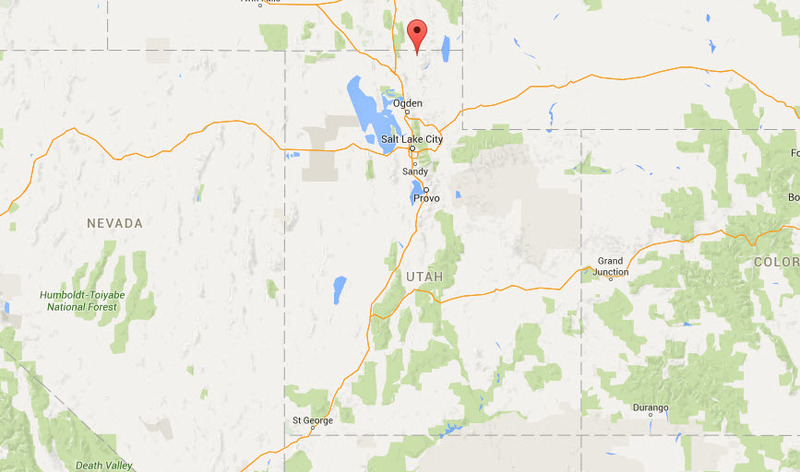 It’s only a few miles from the Idaho state line, at the far northern tip of Utah. The town today has only 2,500 people but thrives as a tightly-knit community of farmers who lead a simple way of life. Richmond is home to “Black & White Days,” which according to the city’s website is the longest-running Holstein cattle show west of the Mississippi. It’s been running for 101 years now! Here’s a look at Richmond’s location in reference to the rest of the state. It’s up there. 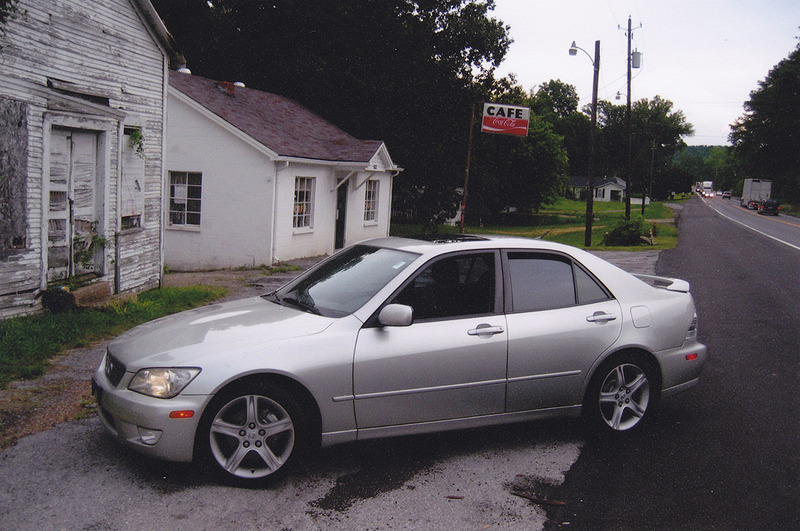 Another photo I dug up was this one, taken 12 years ago when I picked up a 2001 Lexus IS300 in Jacksonville, Florida for my younger brother, Bentley. 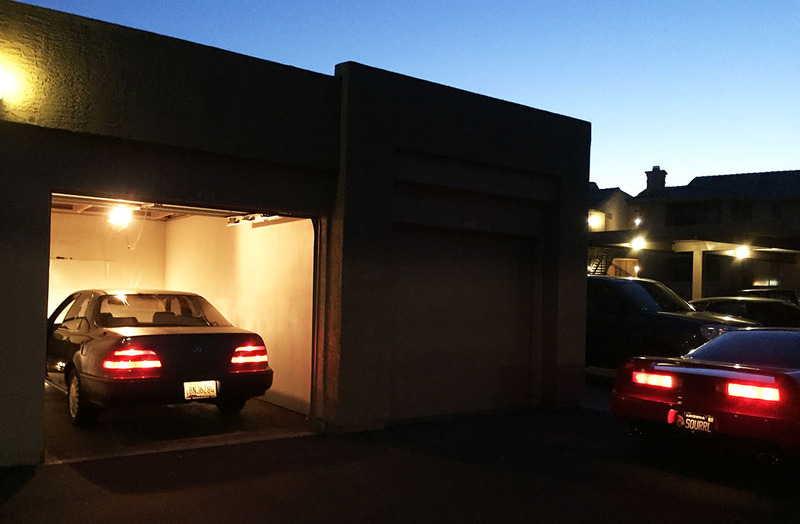 He’d purchased the car sight-unseen from a dealership’s Ebay auction. I drove the car over 2,200 miles home without ever getting a hotel room. I remember taking power-naps in the back seat a couple of times, but I was on a mission to get home. I was 22 years old at the time. I definitely couldn’t survive on that little sleep if I tried doing the same thing today. I never even ended up meeting the seller of this Lexus. 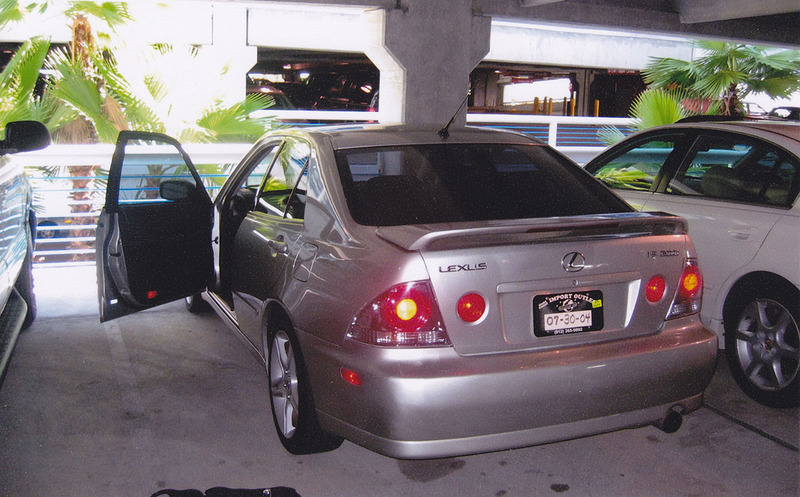 He had left the key to the car under one of the tires in the airport parking lot. How trusting was that of us? He could have easily left me high and dry on the other side of the country! Here was my route home. Remember, this was long before GPS, Google Maps, or any sort of electronic navigation aid. I had printed dozens of pages from MapQuest before flying to Florida and I relied on those printouts, plus a huge Rand McNally atlas, to find my way. I did stop a couple of times for photo opportunities, like this shot near Birmingham, Alabama. This next photo is from August 16, 2003. It was taken in Las Vegas, Nevada. 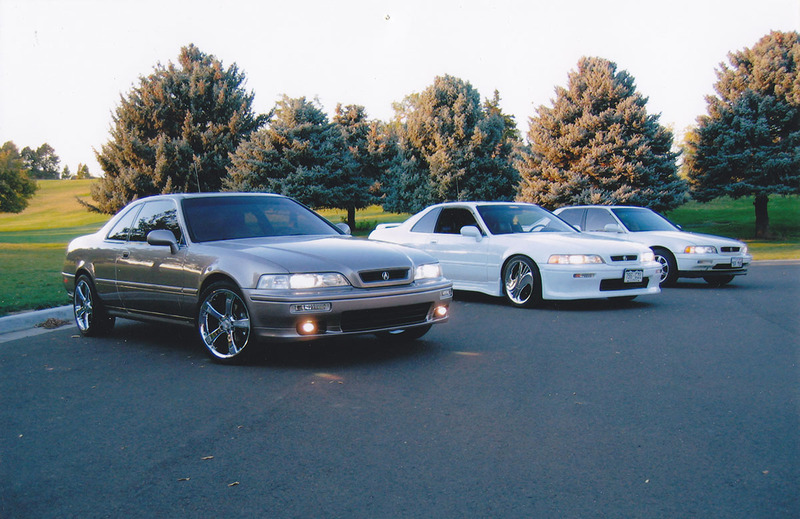 Pictured are four Acura Legends, the first two at left belonging to my friend Jeff Scott, then my car, then my friend Blair’s. Jeff has since sold both of his Legends and currently drives a TL Type-S 6-speed. 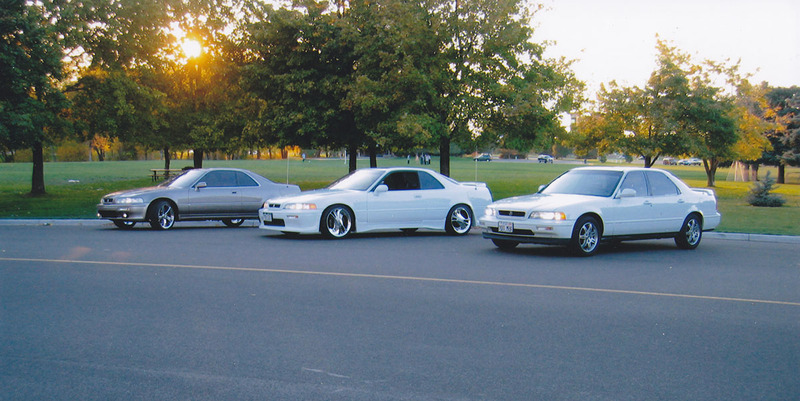 Blair still has his Frost White 1992 coupe but it’s now highly modified. 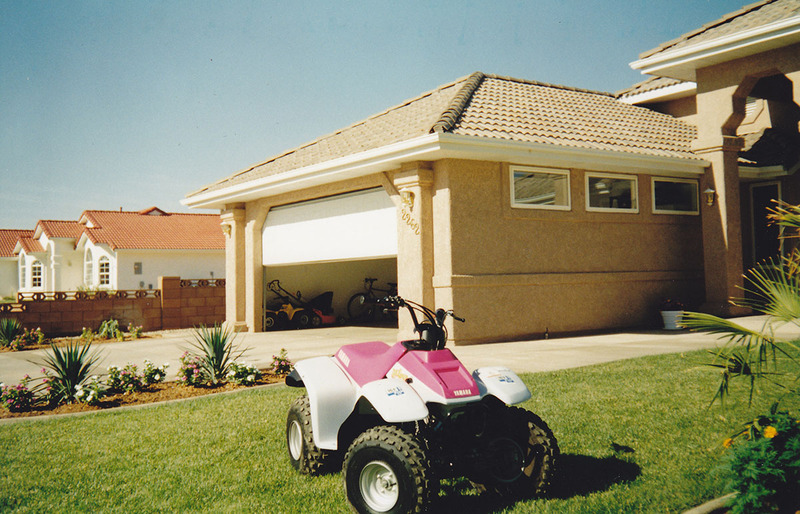 This fun one is of one of my four-wheeled toys before I was a car fanatic. It’s our Yamaha Badger 80cc ATV. I felt compelled one day to pull it out onto the lawn for a photoshoot in St. George, Utah at my family’s home. Coming up next, we have my pride & joy 1989 Honda Prelude 2.0 Si, taken in about 1998. 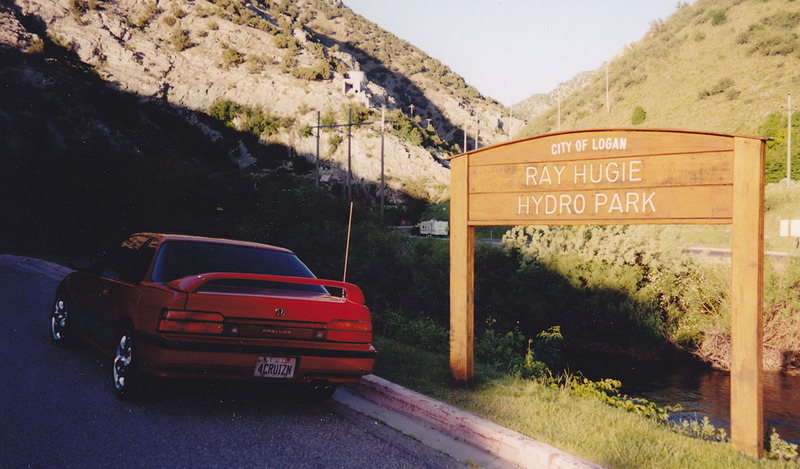 I was in Logan, Utah and visiting a park at the mouth of Logan Canyon on Highway 89 named after a relative (look closely at the wooden sign). It’s called Ray Hugie Hydro Park. Ray served as City Engineer and Public Works Director for 44 years. One of the many projects he led was the development of a $15 million hydroelectric power plant near this location. My Prelude was looking nice! These next two shots were taken in 2003 in Salt Lake City, Utah at Sugarhouse Park. This was a small impromptu Legend meet-up with my friends Dave and Branson. I haven’t talked to Dave in ages and I don’t have his current contact information. Branson still resides in Salt Lake and has gone through about a dozen cars in the last decade. He currently does still have a Legend though, and it’s a 1995 LS coupe 6-speed in Cayman White. 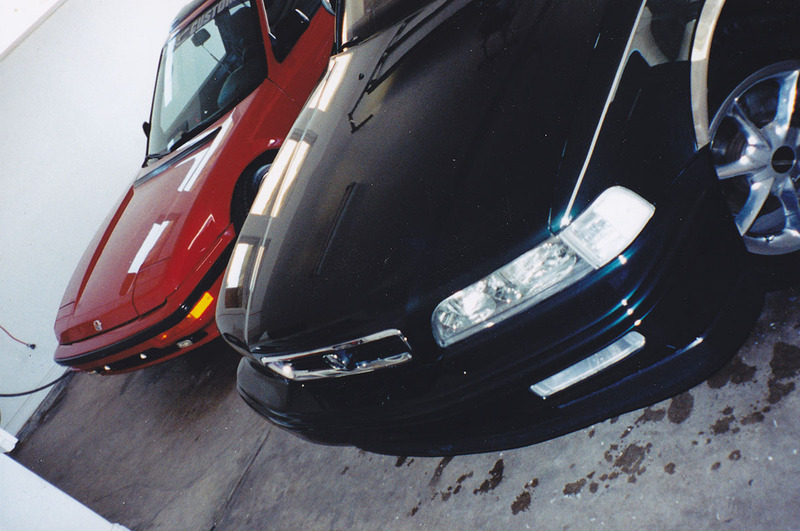 And finally, a shot from the glory days of my Prelude and mom’s chromed-out 1993 Legend. Thanks for joining me for another trip down memory lane! Here are a couple images from modern day. First, the 1993 sedan and NSX switching spots on Monday. I got my new Michelins installed on the ILX, too. 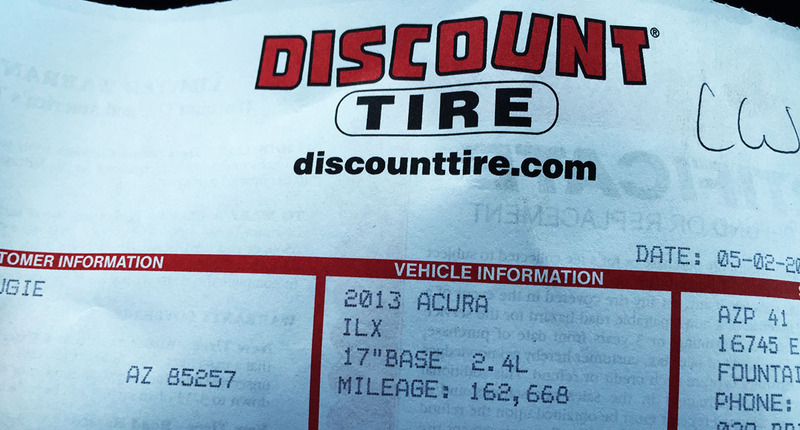 I ran the last set for about 54,000 miles and they still had plenty of life left, but I’m leaving in a couple of weeks on a nearly-8,000-mile drive to Alaska & back so I wanted to have tires in tip-top shape before departure. My brother made me this awesome aluminum car show stand. It weighs only 5 lbs and can fit inside the NSX trunk. The next thing I’m figuring out is what to display on top, and how to attach it. Help me brainstorm! This entry was posted on May 5, 2016 at 9:10 am and is filed under Throwback. You can follow any responses to this entry through the RSS 2.0 feed. You can leave a response, or trackback from your own site. There it is! Ready to scamper! I have a few related things to share regarding your post. Next, your brother’s sign pedestal looks really great. Does he have his own shop? They only fit the 02-04 models but I still have a few left up in the attic if any one wants one… free. That is if the leather and padding haven’t disintegrated from the heat. That show stand is a work of art! The stand is very, very cool. How about a small piece of aluminum, etched with the car’s basic information (I.e. 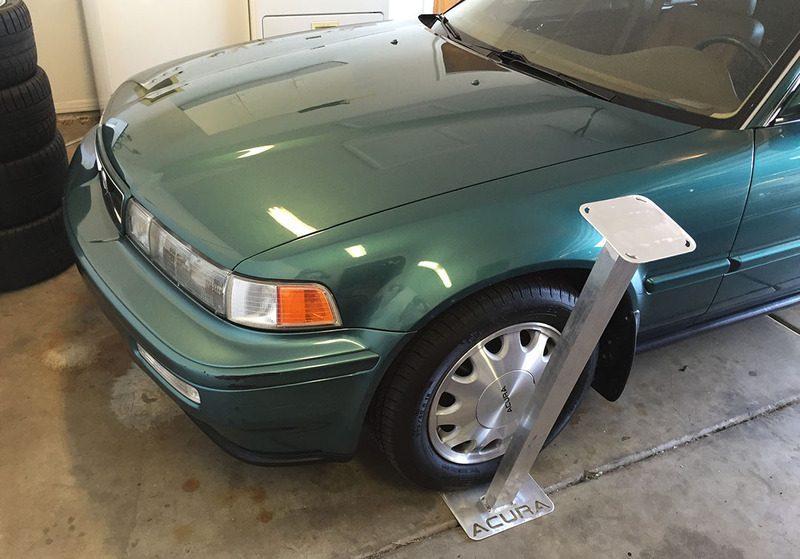 1994 Acura Legend GS coupe). Keep it simple and minimalist. Also, the detailing job you did in the Vigor is ridiculous. Looks showroom fresh in the photos… When I finally bring the Accord out west, feel free to work your magic. Hmm, I like the “keep it simple” thing. 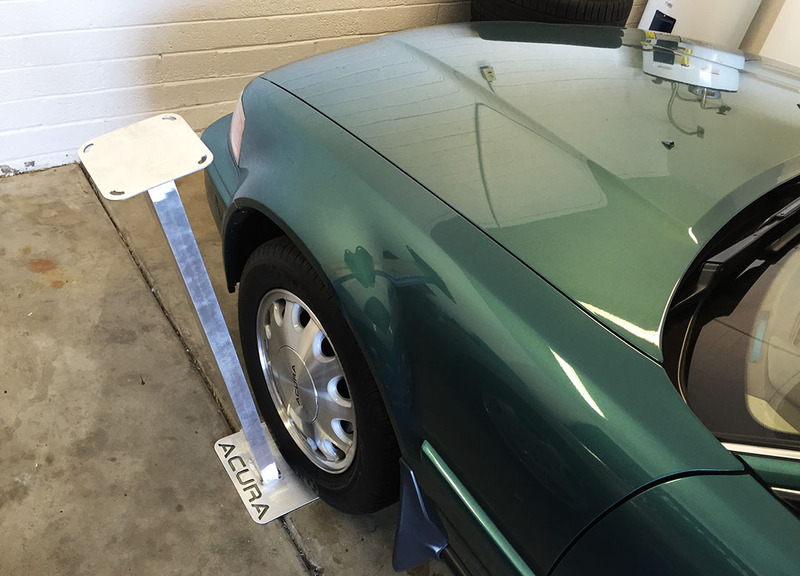 A standard early-90’s Honda window sticker is 11×12 inches and that seems too big for the base. I’ll think of something. And thanks – the Vigor (as far as I know) is all original, 22-year-old, garage-kept paint! Nice little blast from the past! Yes, thank you! You should do a throwback post about some of your old cars. Like off-roading in your Sedona. Love that car show stand! Can’t wait to read about the Alaska road trip!! Thanks!! And awesome. Stay tuned 🙂 Hope you had a great weekend!